← Trunk Borer Management Update: Lorsban (chlorpyrifos) at Risk of Revoked Tolerances in 2016. A one-day summit on ‘New Technology in Apple Scab and Fire Blight Management in the Northeast’ will be held on Monday, March 14th, 2016 from 10:00am to 3:00pm at the Henry A. Wallace Center at the FDR Memorial Library in Hyde Park, NY. The event is sponsored by Red Tomato. Invited guests include Marc Trapman (RIMpro Cloud Service) and Vincent Philion (IRDA, Quebec, Canada) will introduce Rimpro Cloud Service, an interactive Decision Support System for precision disease management in apples. Invited local guest speakers include David Rosenberger, Kerik Cox, Daniel Cooley and Jon Clements. All attendees are welcome to sign up now for a free one-year trial of RIMpro Cloud, a $200 value. 10 AM – Welcome and Introduction. Michael Rozyne, Red Tomato/Eco Apple. 10:15 – New challenges in apple disease management and why precision. Dr. David Rosenberger. 10:45 – Sustainable fruit production in Europe and why RIMpro? Marc Trapman. 11:15 – Introduction to RIMpro Cloud Service and precision management of apple scab. Marc Trapman. 11:45 – RIMpro in Quebec and fire blight management. Vincent Philion. 1 PM – Integrated apple scab management using sanitation. Dr. Daniel Cooley and Vincent Philion. 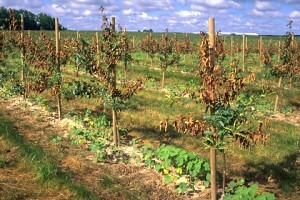 1:45 – The latest on fungicide resistance management for apple scab. Dr. Kerik Cox. 2:15 – MyIPM NE-Disease: an app for helping manage fungicide resistance in apples. Jon Clements. 2:30 – Wrap-up, questions and answers. Marc Trapman and Vincent Philion. 3 PM – Thanks and adjourn. Michael Rozyne. Optional: more hands-on RIMpro demo and help session (Trapman and Philion). Sign Up: Special early bird rate of $60.00/person available until February 12nd, with an additional discount for Red Tomato Eco Growers. A group pricing with the Hampton Inn of Poughkeepsie has limited availability for Sunday night. Call Gideon at 508-316-3494 to confirm availability under the group rate of $109/night.